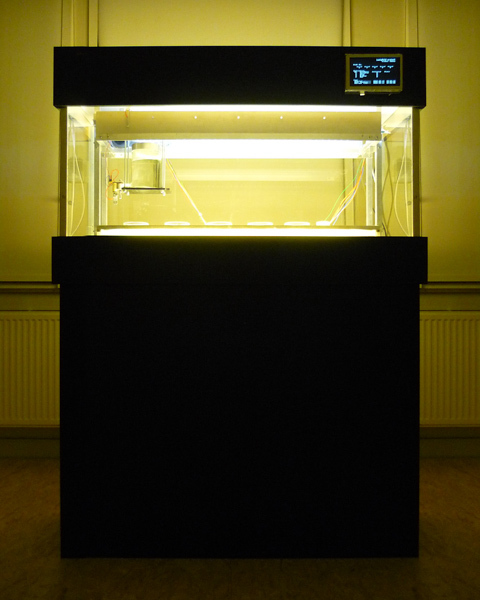 Lucky Mold is an experimental art project with the goal to create a special mold, which has the “gene of good fortune”. If we see “Luck” as one of the abilities of living things to survive, this ability could inherit to their offspring. 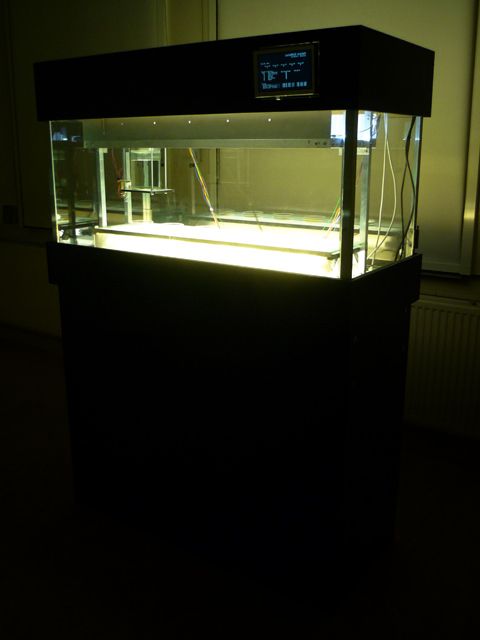 This experiment is carried out in form of a mold-feeding machine to explore the aforementioned theory. 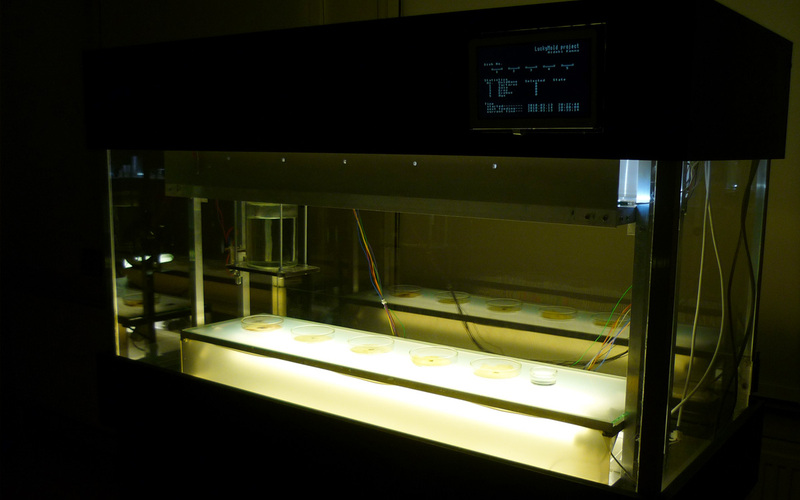 The method is tested with a custom feeding machine for mold. Inside there are several Petri dishes that contain regular mold. 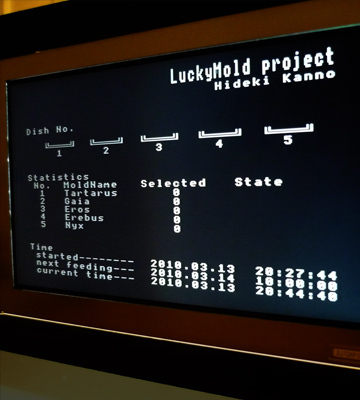 A computer program on a micro-controller randomly chooses one of the mold dishes to supply with a nourishment (their food). 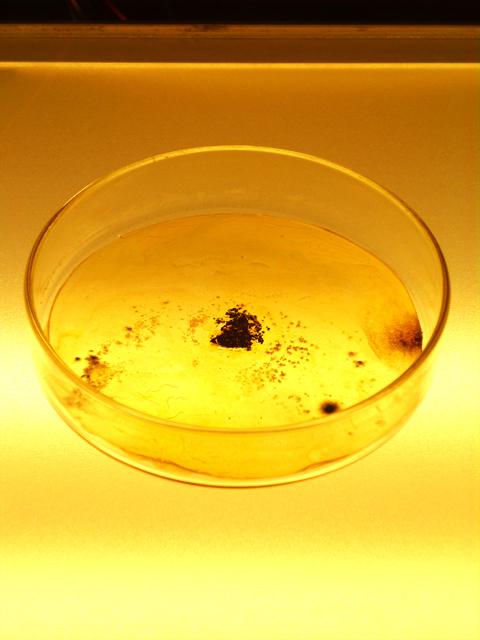 A so-called shooter, carrying a liquid container, drops certain amounts of fluid food on a selected mold’s Petri dish. The selected mold can grow through nourishment while the other mold cannot grow. In time, the most selected mold would stay alive while the least selected mold would die. This means the most selected mold, or lucky mold, is a surviver and all other mold becomes extinct. This is however only one step of the process. The most selected mold of the first round is bred and cultivated. 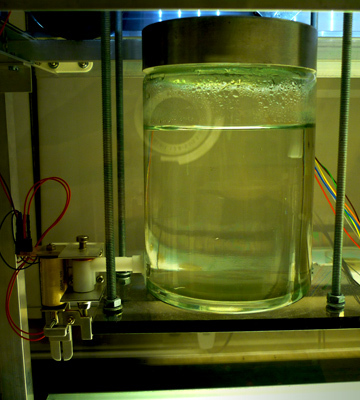 It is devised onto a new set of Petri dishes, again one of them will be selected to be supplied with a nourishment. In addition to the theory of Natural Selection, the individual most adapted to environment is able to survive. So if this selection process goes on for several generations, can we conceive that the last surviver of mold got a strong gene of good fortune? During the last part of the process, the survivor mold will be assessed by the same selection method against the regular mold. Based on the result of this test, we can tell how much the survivor mold’s ability of Luck has increased. What is the Luck? It is a very familiar concept, but it often remains unclear if and how it affects for our life. According to the concept of Natural Selection by Charles Darwin, all living things aimlessly reproduce mutants, and a strict natural environment selects the suitable kinds who survive. 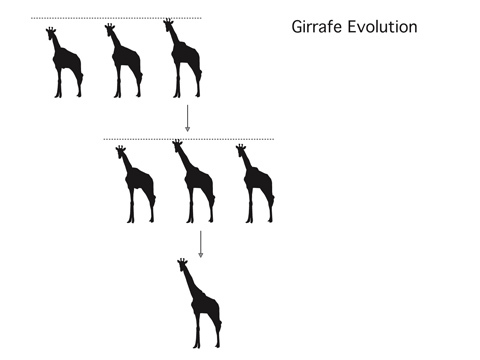 It is a mechanism in which evolution may take place in a population of a specific organism. Organisms or species compete for limited supply of at least one resource (such as food, water, and territory). Darwin thought that all living things are not equal in the ability of survival and reproduction. 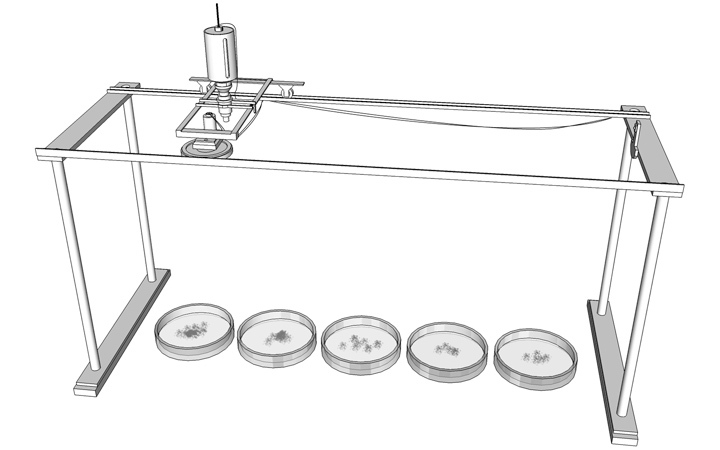 There is a system in which favorable organisms become more common in successive generations of a population of reproducing organisms, and unfavorable organisms become less common, due to the differential reproduction of genotypes. 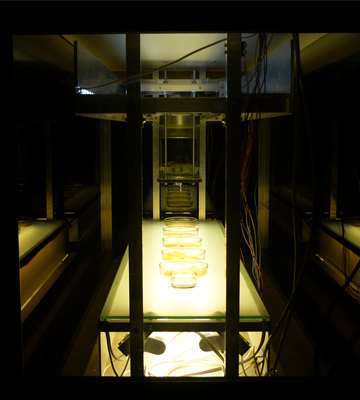 Natural selection acts on the phenotype, or the observable characteristics of an organism, such that individuals with favorable phenotypes are more likely to survive and reproduce than those with less favorable phenotypes. It is a well-known example of natural selection in action is the development of antibiotic resistance in microorganisms.On the other hand, luck is also a very important element by which organisms may survive and reproduce. But luck usually refers to something that happens beyond control. 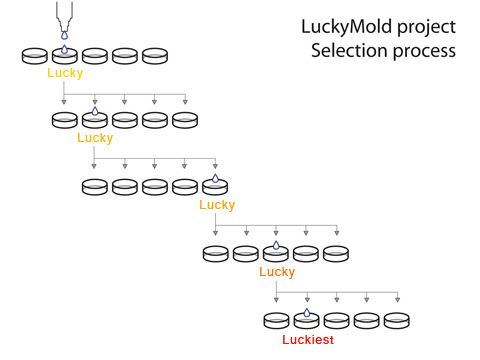 With Lucky Mold Project, luck is conceived as an ability necessary for surviving, and is observed whether it is inherited during generations as part of evolution.